I was birding on the boardwalk at Magee Marsh, Ohio yesterday when I received news that the Downtown peregrine chicks had been removed from their nest on Tuesday May 8 around 9am. Many reporters were on hand to record the event. Here are four news articles (media in alphabetical order). 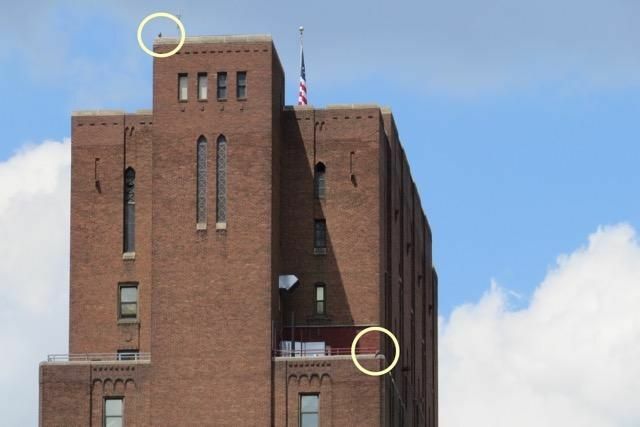 Hours later, Lori Maggio visited Third Avenue at lunchtime and found Dori and Louie perched on Lawrence Hall across the street from their former nest. They watched calmly because there were no people on the roof. Eventually the peregrines will be less vigilant, especially if people stay away from the nest-roof area for a while. At top, Dori watches from across the street. 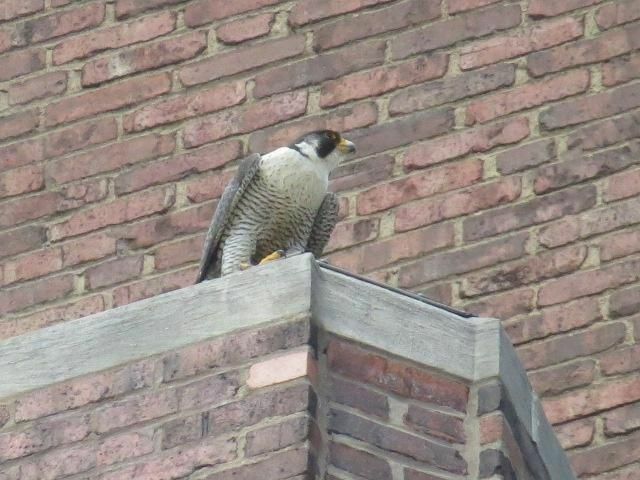 Below, Louie watches from the top parapet of Lawrence Hall. The silver lining for the chicks is this: These four won’t face death at fledging time. I have seen too many die gruesome deaths because the Third Avenue nest is too low. Half die within two weeks, sometimes slowly and painfully before they are discovered. These four chicks will do well. p.s. A Caution to Commenters: During this emotional time … if you post a comment that could inflame others, I may edit or delete it. Louie is a Grand Old Man and has lived through many Banding Days — and the “kids” have always been put back before. Poor old fellow is probably wondering what the heck is taking so long this time! Good luck to the youngsters, and I hope they are hacked together. Any word on how many boys/girls? Thank you, Kate! This whole situation saddened and angered me, so a big Thank You for the bright side that they will do well because of not facing city dangers. I, and probably others, needed that . I agree with you one thousand percent Cindy Lou! Thank you so much Kate for leading us all through this. May those chicks soar!! I have every confidence this was a good decision. Your remarks about the chicks being safer during growth and fledging in the rescue center rather than downtown is good. Injured or dead peregrines are heart wrenching (been there), so their chances are so high that they will survive and fly. It’s obvious much work has gone into bring about this result. There must be thanks to those who brought about this solution, and to those who will work with these chicks to raise them properly. Thanks, Kate, for helping us see the light. Thank you so much for the update!! Hopefully next year they will go back to the other site. Why don’t the falcons naturally gravitate to cliffs. For example, why wouldn’t they nest on the side of Mt. Wash, or other cliff areas around the city? From what I can see of their wild nesting places, they like bare rock places. Mt. Washington is full of trees – too wooded? Although with all the landslides this spring, that might change . . . Yes the cliff at Mt. Washington is not steep enough and it is too wooded. Peregrines like cliffs as steep and sheer as skyscrapers — which is why they use buildings. Thanks, Kate, for pointing out the positive side. Not running into buildings or being hit by cars takes away at least some of the dangers these young lives will face. Jill Argall and her staff do an amazing job, and their experience in helping peregrines should give the chicks a fighting chance. The KDKA report ended with speculation that Dori and Louie could leave the area. I hope they stay downtown and (here’s hoping) return to the Gulf Tower. I agree. We should focus on the positive and remember that we are creeping into their world. These great and terrible things would go on and we would never know if it wasn’t for the cameras and the wonderful folks that keep us updated with information. Sometimes happy sometimes sad……always grateful for the experience of all of these cameras. I hope that the building owner does something to that nesting site to dissuade the pair from using it again. Maybe having their chicks removed will keep them from nesting their again. Maybe that’s why Dori doesn’t like the Gulf Tower, because she knows that people will come and take her chicks away, if only briefly. I am so sad that that this move was able to happen. Shame on all of the people and organizations who allowed this to happen. If the chicks were in danger or distress for some reason I could totally agree that it was in their best interest that they be moved to be taken care of by humans. But to rip them away from their parents for no other reason but to work on a building so they can rent it out to make money just makes me sick to my stomach. Since they went ahead with this even with all the public outcry, I hope someone does something to block that air shaft so that Dori and Louie can not nest there in the future. It’s a real shame that they can’t nest where they want but I’m hoping that next year they come back to the Gulf Tower where they are very much wanted and very much appreciated. I know the chicks are going to be well taken care of, but I really worry about Dori and Louie. Both pairs of our falcons seem to be really stressed out when they take the chicks during the banding process but they are always returned to the nest. This time Dori and Louie’s chicks didn’t come back. I remember reading on your blog that wild peregrine falcons regard humans with fear and loathing. We are their enemies. That couldn’t be more true than right now. This just wasn’t right. Kate – Could the chicks have been moved to Gulf Tower? Would the parents have followed them? Would the rescuers have fed chicks until parents appeared? Regardless, I am happy the eyases will cared for and successful upon release. Joyce, that idea was proposed (by more than one person) but the PGC felt there was too big a chance that the eyases would not be found by the adults. I agree wholeheartedly with the other posters about seeing the bright side of this situation. When it all started I was so upset and could only see it in a negative way. Kate, you continue to educate and guide us so well with your words. Now, the image in my head is of those babies growing and soaring in open air and having a good shot at life. Well done. Thank you. Dori and Louie prefer man-made structures, as do many peregrines. Other species of wildlife have also become habituated to the urban environment, like deer, possums, squirrels and raccoons, who tend to be fatter and healthier than their rural counterparts. As such, I applaud the Gulf Tower, who actually values the peregrines and gives them a nice nest box. We need more forward thinking owners who unselfishly accommodate our urban wildlife and provide suitable nesting for our peregrines. I hope developers like BET either mend their ways or go back where they came from! You say many of Dori and Louie’s chicks have been taken to this rehab place. How many have actually survived the rehab? How many chicks fledge successfully from Gulf Tower? Does the 3rd Avenue nesting site have more casualties than the Gulf Tower? I had understood that the buildings are far safer to fledge from than the bridges. And who knows how many fledgling peregrines on natural cliffs die from predation or starvation? If peregrines prefer man-made urban environments it must be due to a greater food source of bread-fed pigeons? I know you are trying to justify this taking, but, to me, and likely to many other peregrine fans, it raises a lot more questions than what it answers. Robin, many more chicks have to be rescued from Third Ave than Gulf. 1 chick per year at Gulf, all chicks rescued from the street every year at Third Ave. Those rescued from Gulf have been successfully released after rehab at Humane Animal Rescue. Those injured from Third Ave are too mangled to make it. The nest site is too low! Buildings are safer than bridges but wild areas are best. My preference has always been that the chicks stay with their parents. I am pointing out the silver lining on this dark cloud. I agree with Carol D. This was sad what they did. We need to start having compassion! Going after the mighty dollar! Compassion has to start sometime! I wonder when. Sad event but hopefully next year they will nest at the gulf tower and we can watch them. 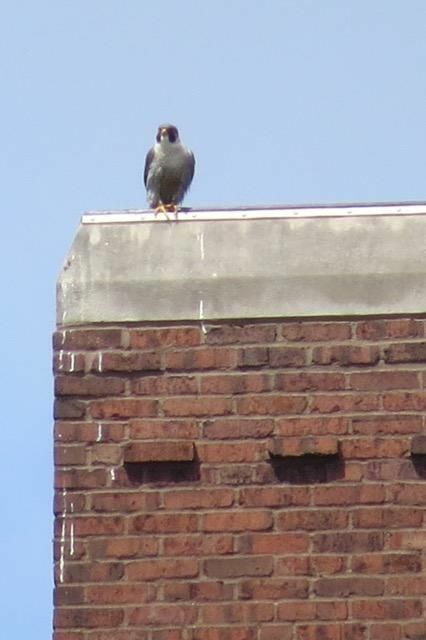 They are great peregrine parents so my sadness is for them. Chicks should be ok and will receive excellent care and for that I am thankful. Rough for those of us who care so deeply. Thanks, Kate, for pointing out the bright side of this otherwise sad story. Hoping that the chicks will be able to soar free in no time.